Some years ago, the quarry at Craig Rhos y Felin became the focus of work led by professor Mike Parker Pearson. The claim was made that some stones from this quarry petrologically matched a number of stones at Stonehenge. This work was duly written up in Antiquity, Volume 89 Issue 348 – contributors listed were Mike Parker Pearson, Richard Bevins, Rob Ixer, Joshua Pollard, Colin Richards, Kate Welham, Ben Chan, Kevan Edinborough, Derek Hamilton, Richard Macphail, Duncan Schlee, Jean-Luc Schwenninger, Ellen Simmons and Martin Smith. Despite this formidable army of specialists having contributed to the study, it has still remained rather too easy for critics to point out that the stones at Rhos y Felin were not the spotted dolerite that make up the finest and most elegant of the bluestones that remain at Stonehenge. Similarly, because no artefact has been recovered to suggest any method or mechanism for transporting these stones along their seemingly unfeasible journey to Salisbury Plain, the glacial flux people remain vociferous in their objections to this work ‘proving’ the case that many of the Stonehenge bluestones originated in the Preselis. This recent press release changes the odds on the matter. It concerns a strontium based study done on the remains of bones from cremated remains found at Stonehenge, and suggests that some of these had once belonged to people that had originated and been brought up in the Preseli Hills. This is indeed helpful grist to the mill that supports human intent in transporting bluestones from West Wales to Stonehenge. This could not be a more revealing remark with which to finish his comments. Why? Because archaeologists involved in this quest have worked hard for years to supply an answer they cannot ever get near to, unless it picks up some missing components in the training of archaeologists. Regrettably, this is the same archaeology that continues to refute that Neolithic people had the ability to do all the things that professor Thom, Fred Hoyle and ‘Dickie’ Atkinson had claimed for them. And what is that about? Peer group exclusion and refusing to countenance new evidence from outside the ‘cosy box’ has a long and rather sordid history within archaeology, and is no less practiced today than it was when the one-time Astronomer Royal, Sir Norman Lockyer first used an astronomical method of dating Stonehenge during the opening years of the twentieth century (by estimating the change in the angle of the ecliptic). Later during the post-war years, Prof Alexander Thom was very roughly treated for suggesting that a standard megalithic unit of length had been employed, from Brittany to Shetland, and that many stone circles were flattened, egg-shaped or elliptical because of the use of a set of geometrical templates required to produce the commonly found ‘standard’ designs he surveyed at non-circular stone rings. Thom did the academic archaeologists a great favour by writing three academic styled text books on the subject of megalithic astronomy, geometry and metrology, athree subjects he identified as making up a megalithic science. These books were all published by Oxford University press. All of these things have now been placed in an exclusion zone beyond the subject of archaeology or the learning of archaeology students. They have ceased to be, as far as the academic archaeologists is concerned, a silly folly, best forgotten. However, these very subjects form the entry point by which it is possible to find an alternative way by which one may enter into the Neolithic mind-set – right into the heads of the builders of Stonehenge. This website [www.robinheath.info] is full of articles showing how that task may be achieved, as are my books, based on evidence gleaned over thirty years of research into megalithic science. 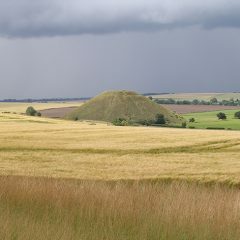 It is unlikely that archaeologists will ever solve the problem of understanding megalithic minds while they believe that these ancestors of ours could not count, did not accurately observe the skies, did not have the capacity to design calendars or work a form of accurate surveying across large tracts of the European landscape. As a science graduate, a qualified educationalist and a long time student of the history of science, this is very reminiscient of the long febrile cover up and wilful obfuscation that surrounded the then newly emerging idea that the earth actually went around the sun and not the other way round. We hear little about epicycles today, change eventually bulldozed flat the old order on a geocentric earth, allowing our modern astronomy to slowly emerge from the dust of medieval thought and into a heliocentric future. Modern archaeology prides itself on being a multi-discipline subject. If this were true then archaeologists would not have ‘complaineth too much’ about the work and findings of professors Gerald Hawkins, Alex Thom, Richard Atkinson, Dr Euan MacKie and many other notables. I respectfully suggest that if the reader sincerely wishes to get to grips with how important this issue is, in understanding prehistoric capabilities, then one could do far worse than watching the BBC web archives, which offer a wonderful 1970 Chronicle documentary about Thom and his work, entitled Alexander Thom – Cracking the Stone Age Code, with all the archaeologists of that time having their say for or against, and sometimes both! It is great fun, educational for many reasons, and the music is by Dr Who electronica composer/ arranger Delia Derbyshire – what more could anyone want?